I've never loved mangoes before as much as I do now. Here I am in Taiwan, with the most amazing fruit ever around me every day. The pineapple is so incredibly sweet. The mango too. And though I've been an apple-a-day kind of girl for years, the gorgeous array of fruits here has pulled me well out of that humdrum routine and gotten me reveling in all that Taiwan has to offer. Fresh lychees for breakfast one day, chilled watermelon juice as welcome refreshment on a sultry hot afternoon on another day. Wax apples (lianwu) at the night markets, and honey-sweet pineapple as an after-dinner treat. There are markets devoted just to the selling of fruit here...so much variety to choose from! And where else does this heavenly fruit show up? On hua bing! Shave ice with dark sugar syrup, topped with fresh mango and condensed milk, enjoyed out on the Cijin Island district of Kaohsiung on one of my weekend outings...this is truly food of the gods. 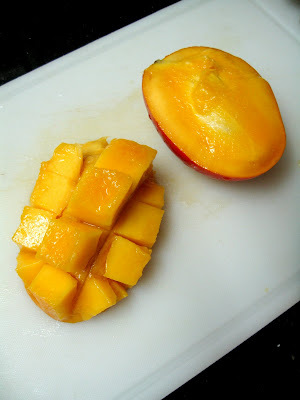 I've been enjoying these mangoes for breakfast too. Just cubed up with some whole milk poured over. Easy, sweet, and refreshing. While I'm doing my part over here, I just want to send out a loving reminder that you also make sure and get your recommended servings of fruit each day! Erica - So good to see you fully enjoying your stay in Taiwan. 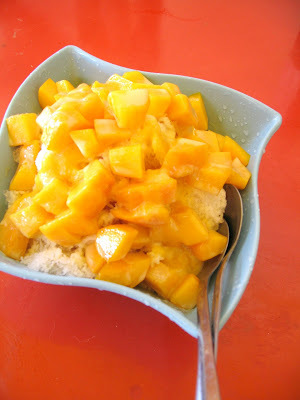 Those fruits look great, and I love shaved ice with fruits too - called bingsu in Korean. That looks so good... I just had mangos but they look nothing like that! Sounds like you're having a great time!!! And now, off to Korea!